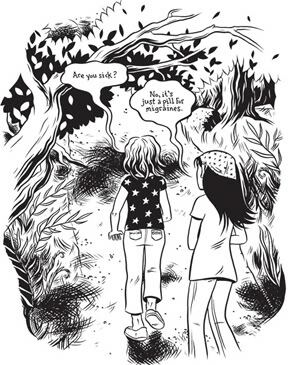 Nothing says summer quite like summer camp, so in this column, we highlight Chiggersby Hope Larson (Atheneum Books, 2008), a young adult graphic novel about the friendships, fun, and foils of summer camp. Chiggers is graphic novel that takes an honest look at the timeless ritual of summer camp as seen and experienced first-hand by Abby, a young teen attending her last year as a camper at sleep-away camp. 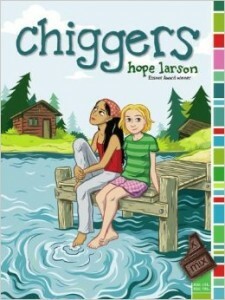 Chiggers is a Junior Library Guild Selection and YALSA Great Graphic Novel for Teens Nominee. It follows Abby from the moment her parents rush her out of the house and drive her through country highways and hills to get her to camp before any other campers arrive and concludes when her parents are the first car in line on the last day of camp to take her home. It’s a story about friendship, fitting in, love, and loyalty, and it interweaves realities and fantasies of summer life. Abby finds herself torn between her old and familiar summer friends and an intriguing new girl Shasta. In addition to the daily drama in her bunk, where her old friends appear to judge Shasta harshly and unfairly, there is also drama between Abby and Shasta as they find themselves attracted to the same boy. Amidst all the summer drama fun, Larson includes the Egyptian Rat Screw card game and friendship bracelets, along with how-to directions. The book opens with Abby who gets to camp way earlier than any of the other campers. The good news is she gets the pick of the bunks; the bad news is that she waits a long time for anyone else to join her. As she waits, she takes out a book to read, and her friend Rose, who is a few years older than Abby and their Cabin Assistant, briefly stops by to say hello. Slowly, the other girls arrive, and it is clear that there are cabin cliques. Abby’s friends are Beth and Zoe. 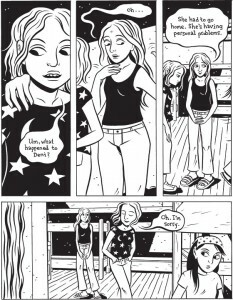 Beth’s ears are triple-pierced, and when she’s sixteen she plans to pierce her nose. 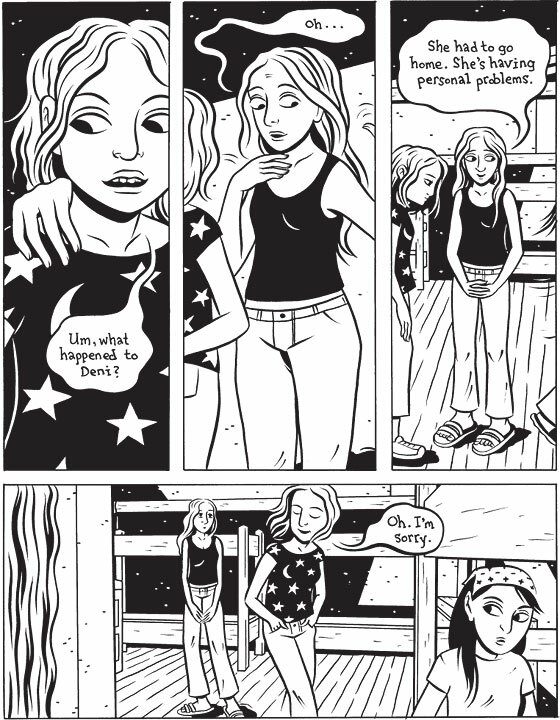 Beth loves the band Spite Storm, whose poster she hangs by her bunk, and she tells Abby that she’s starting a band (“when I get better at guitar”) with her boyfriend. Zoe is also an avid Spite Storm fan who’s “totally in love with Ricky Vee.” As Zoe and Beth discuss Spite Storm’s albums, Abby feels totally “uncool” and very left out. But soon they play Egyptian Rat Screw (Larson includes the instructions), and all is good. 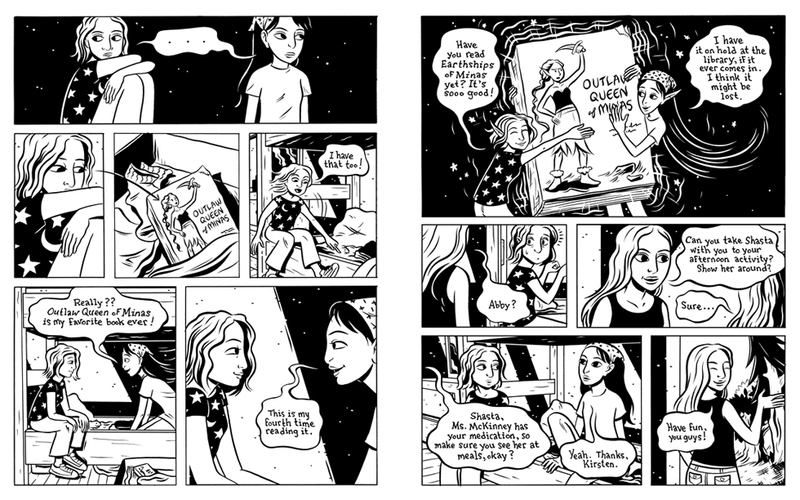 Deni, the girl who has the bottom bunk in Abby’s bed, is homesick and part of another group of girls. She is appalled that Asheville’s such a hick town and that iPods aren’t allowed in camp — nor are watches — and she leaves camp the next day. Replacing Deni is a new girl, Shasta, who Abby is asked to show around. Abby seems to have an instant connection with Shasta. Shasta’s from Florida, “the lightning capital of the world,” and Abby’s grandmother sometimes lives nearby. Abby’s from North Carolina “hick capital of the world.” They also share a favorite book, Outlaw Queen of Minas, which they’ve both read A LOT. As Abby shows Shasta around camp, she learns that Shasta has an Internet boyfriend, is one-eighth Cherokee, and was struck by lightning. Abby’s life in camp isn’t easy. One problem is that Beth and Zoe don’t like Shasta, and they let Abby know this as often as they can. Abby has to figure out how to maintain her friendship with Shasta without wrecking her friendship with Beth and Zoe. Another problem is that Shasta always seems to have an excuse for not joining in camp activities. This makes Abby wonder about her choice in friends. One final problem between Abby and Shasta is that they both like Teal, a nerdy Dungeon Master who is Rose’s cousin. As the summer progresses, Shasta breaks up with her Internet boyfriend and feels she, like Abby, has a “special connection” with Teal. Finally, as things can’t seem to get any worse, Shasta is almost struck a second time by lightning (Abby saves her), but she is sent away from camp early because she hasn’t taken her medication and the camp feels they can no longer be responsible for Shasta. Shasta and Abby resolve their differences and part as friends. Hope Larson tells a strong story about friendship, loyalty, and choices and provides card game and friendship bracelet instructions, making this a heart-warming summer choice for young teenagers. An honest look at the ins and outs of summer sleep-away camp. Hope Larson is a master at developing her characters. Discuss how Larson establishes the cabin cliques and how expectations are set based on stereotypes. Discuss how well these stereotypes hold throughout the book. Have students work individually, in pairs, or in groups to create a Venn diagram representing how Abby, Beth, Zoe, and Shasta’s personalities, likes, and dislikes overlap. Have students discuss the similarities and differences among these friends. Discuss how important it is to Abby to fit in with Beth and Zoe. Find incidents where Abby does and does not fit in with them. Discuss what strategies your students might use in those same situations. Discuss Larson’s choice of titles for the band name (Spite Storm) and their song/album titles (Chrome Unicorn, On Jupiter). What type of music might they play, and what might the content of those songs be? What about the band Beth wants to start with her boyfriend (Glittergloom)? Have students discuss band and song titles they might create and why. On page 9, Deni says, “Did you see Asheville from the plane? Total hick town.” Her friend adds, “My aunt lives there, and she’s scared to walk downtown ‘cause of all the hippies.” What is this friend implying? Discuss why her aunt would be afraid of the hippies. Discuss Larson’s choice of title and how chiggers relate to the story (see links below for more on chiggers). 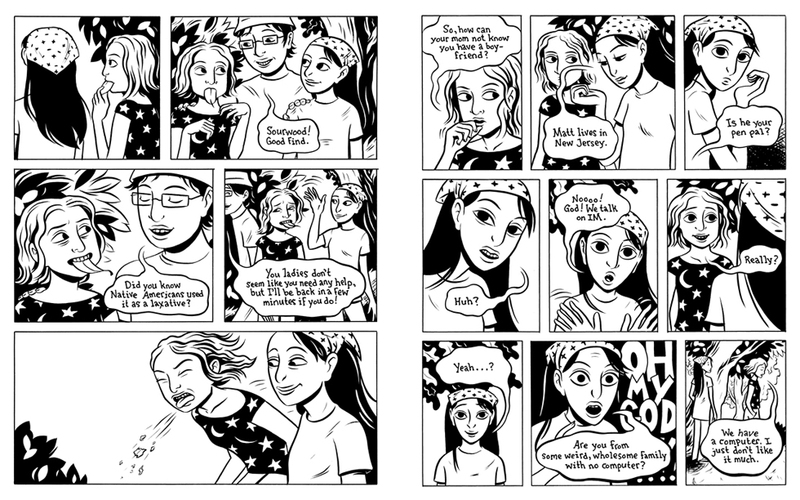 This book is all about navigating social situations at summer camp. Have students come up with their own handbooks or unofficial social rules for camp and for school. Discuss how, if at all, they might differ. When meeting Shasta for the first time at lunch, Beth asks, “So are you the new Deni?” What does she mean by this? On page 49, after meeting Shasta, Beth passes Abby a note about Shasta saying, “I HATE HER!! What’s her problem? She’s really snobby!” Why would they get that impression? Working individually, in pairs, or in groups, have students chart how Larson moves from fantasy panels (daydreaming, sleeping, thinking about crushes, etc.) to real life panels. Discuss Larson’s use of text and images towards this end. Evaluate and discuss how Larson creates a sense of magic around Shasta’s experience around will-o-wisps and lightening (see pages 54-55 for examples). On page 70, Abby was split from Beth and Zoe at lunch (there weren’t three seats together). Beth and Zoe sat together and Shasta had saved a seat for Abby with some guys from her Wilderness group. At one point, Abby walks away and sees Beth and Zoe talking. 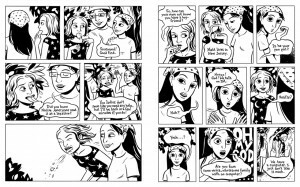 There are two panels across the page, one with empty odd shaped text balloons and the next with snakes and thorny vines slinking out of their mouths. What message do these images relay? Nothing Can Possibly Go Wrong by Prudence Shen and Faith Erin Hicks — a graphic novel full of unlikely friendships and nicely nuanced characters who bend and shatter stereotypes and expectations. Stuck in the Middle: Seventeen Comics from an UNPLEASANT Age — an anthology of honest, sensitive and humorous comics about the early teen years edited by Ariel Schrag. 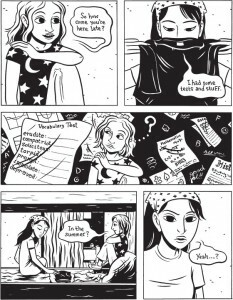 In this anthology, seventeen comic book artists relate incidents from their “awkward” middle school years. Smile by Raina Telgemeier — a graphic novel memoir about Raina’s awkward middle school years compounded with added embarrassment of serious dental issues. The Absolutely True Story of a Part Time Indian by Sherman Alexie — about a bright motivated young Native American who must decide between a long commute to a better all-white school off the reservation and face ridicule from white kids he must befriend and from his local friends he leaves behind, or to remain with his friends at the reservation’s limited high school and head nowhere fast. http://animals.howstuffworks.com/arachnids/question488.htm: for details about chiggers and their bites. All images (c) Hope Larson.